If you are using video player software which does not fully support native H.265 files, then you need a H.265/HEVC video converter application. The idea of a H.265/HEVC video converter is to take your high quality h.265 files and convert them into a supported format of your choice. Below you will find our selection of the five best H.265/HEVC Video Converters that you can use to convert ultra high definition H.265 videos. 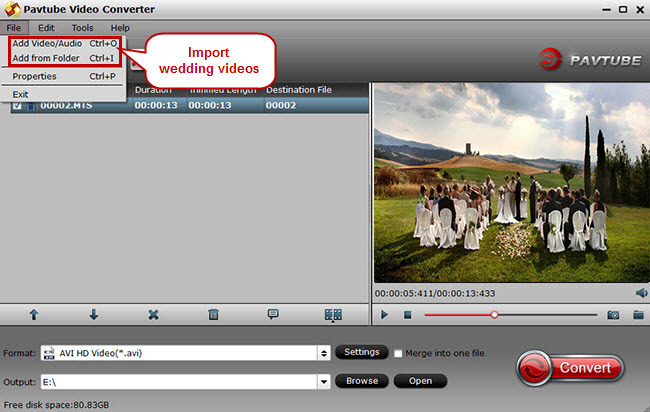 Pavtube Video Converter Ultimate is an all in one video editor, player and converter. If, for example, you have come across a brilliant H.265/HEVC video that you love on computer or from Samsung NX1 and would love to have a copy of it on your computer or players, Pavtube Video Converter Ultimate makes that possible. It is an ultimate application that is able to decode H.265/HEVC for multiple use and encode common video files to high quality H.265 mp4 video with 50% compression. Options such as resolution, frame rate and bit rate can all be selected before you start the conversion process. Get a 50% off disount for Pavtube Video Converter Ultimate by joining Pavtube Black Friday & Cyber Monday Crazy Promotion. More surprises are waiting for you. Pavtube Video Converter offers the easiest and best way to convert multiple audio and video sources to the desired audio/video format. This program not only allows you to convert video types such as SD videos, HD footages from camcorders (XAVC MXF, AVCHD) and TiVo/DVR recordings to H.265/HEVC, but also convert all your videos to convert all your videos to MP4, MKV, AVI, WMV, FLV and almost any audio/video format for free entertainment on mobile devices(iPhone 6/6Plus, iPad Air 2, iPad mini 3, Galaxy Tab S, Galaxy Note Pro 12.2, Nexus 7/9, Kindle Fire HDX 8.9, Surface Pro 3). You can also realize your movie director dream with the built-in video editor. What is worth mentioning, batch conversion and GPU acceleration can largely save your energy and time. Only $9.9 for Pavtube Video Converter at Pavtube Black Friday & Cyber Monday Crazy Promotion . Cinemartin Cinec (Read a review) is a multi video encoder for windows. It is proud to release a plugin for various NLE editors, initially for Adobe Premiere Pro, that allow users to export sequence timeline to all versions of prores and to HEVC H.265. You can convert videos from several video formats. Quality is the top of the software, that accommodates fast processing capabilities, featured in a software that allow multiple CPU cores to be dedicated to encode. With the highest quality as professionals demand, cinec also allows, in a simple way, Cut or split videos instantly with or without encode (no reencode). MediaCoder 0.8.32 released with multiple-pass H.265 encoding, here is a beta testing. Also it provides all the tools needed to convert audio and video clips, but it also adds a level of complexity that audiophiles will love. Casual users, however, will be confused and should steer clear. Then you need an alternative to MediaCoder. The good news for Linux users is that the H.265 codec is available in the popular encoding suite “ffmpeg.”Although ‘ffmpeg’ probably exists in your distro’s repositories, it might be out of date or it might not have support for H.265 compiled in. Download either the 32-bit or 64-bit .tar.xz file. If you are unsure which one to download, then use the 32-bit one. In the directory where you downloaded the file, run the following command to unpack the archive file. Learn more details to use it or get an FFmpeg Alternative if you need a simple procedure. TDMore version 1.0.0.7 adds improved support for the H.265 (HVEC) codec. The company promises faster encoding, smaller file size and better video quality. It is available for Windows Vista, Windows 7, Windows 8 and Windows 8.1. With a built-in optimized profile bank, TDMore Blu-ray Converter is able to cover all the mainstream video formats and popular devices, and the profiles are still growing fast. So which H.265/HEVC Video video converter application is the best choice for you? As you can see, they have very similar functions, so it is simply a matter of experimenting; many provide free trial versions so you are able to evaluate quickly before making a final decision. But for me I like Pavtube best since it provides important roles if you are wishing to preview, edit, decode and encode H.265 yourself for playing a native H.265 movie on a device or screen that may not yet support it. It is easy-to-use as well as effective. Now, it’s time for you to enjoy H.265/HEVC video feast. Hot News!!! Pavtube Software has been updated to Version 4.9.0.0 for All Windows 10/8.1/8 users to support newest NVIDIA CUDA & AMD APP technology in video decoding to improve performance and ensure users much faster conversion speed than ever before when coping/ripping/converting DVD/Blu-ray, since more CPU resources are spared because of NVIDIA CUDA’s harnessing the power of GPU and AMD APP’s co-using of GPU and CPU. How to Enable DVD to playback on Roku 3 for Mac? How to Mirror iTunes M4V Movies and TV shows to Roku 3?